The obvious benefit of membership in the Marine Corps League Outer Banks Detachment is to enjoy the camaraderie that we who are Marines share. More importantly, as Marines we were taught from day-one to seek leadership responsibilities. As members of the Outer Banks Detachment we demonstrate our commitment to that principal through self-example in our local community, and by supporting our fellow Marines and worthwhile activities within the Outer Banks area. Regular membership is available for those with honorable service as Marines or FMF Navy Corpsman as outlined below in "Regular Membership Eligibility Criteria." 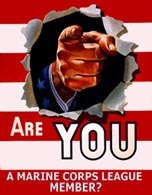 Associate membership is available for those with no Marine Corps or Navy FMF Corpsman service, eighteen (18) years of age or older who espouse the principals and purposes of the Marine Corps League including those who have served honorably in other branches of the Armed Forces of the United States. Upon acceptance, associate members will receive a membership pin and membership card, and are entitled to the same rights, privileges and benefits as regular members with the exception of those outlined under "Associate Membership Restrictions." Currently serving or served honorably as a U.S. Navy Corpsman who has trained with Marine FMF units in excess of ninety (90) days and who has earned the the Marine Corps Device or the Warfare device authorized for wear on the Service Ribbon. A photo-static copy of an applicant's most recent Honorable Discharge Certificate (DD Form 256MC or DD Form 256N) or Release from Active Duty (DD Form 214/215) is required with each regular membership application to provide evidence or satisfactory service. For those currently serving on active duty, a photo-static copy of their Military ID Card is required. Associate members will not wear any uniform items that they are prohibited from wearing by the current Marine Corps League uniform regulations. Outer Banks Detachment dues for new members is $35, payable at the time a regular or associate membership application is submitted. Those eligible and interested in becoming a regular or associate member should complete the appropriate membership application. I, ______________, in the presence of Almighty God and the members of the Marine Corps League, here assembled, being fully aware of the symbols, motto, principles and purposes, of the Marine Corps League, do solemnly swear, that I will uphold and defend the Constitution and Laws of the United States of America and of the Marine Corps League. I will never knowingly wrong, deceive, or defraud the League, to the value of anything. I will never knowingly wrong or injure or permit any member, or any member's family, to be wronged or injured, if to prevent same is within my power. I will never propose for membership, one known to me, to be unqualified or unworthy to become a member of the League. I further promise to govern my conduct in the League's affairs and in my personal life, in a manner becoming a decent and honorable person, and will never knowingly bring discredit to the League. So help me, God. I, ______________, in the presence of Almighty God and the members of the Marine Corps League, here assembled, being fully aware that as an Associate Member, I will not be permitted to hold elective office, or to vote on Marine Corps League policy, a membership application, or an election of officers, do solemnly swear, that I will uphold and defend the Constitution and Laws of the United States of America and of the Marine Corps League. I will never knowingly wrong or injure, or permit any member, or any member's family to be wronged or injured, if to prevent same is within my power. I further promise to govern my conduct in the League's affairs and in my personal life, in a manner becoming a decent and honorable person, and will never knowingly bring discredit to the League. So help me, God. There is no uniform required for any member of the Outer Banks Detachment. Regular or Associate members wishing to purchase official Marine Corps League uniform items may do so at their own expense through the Marine Corps League Ship's Store or through other authorized vendors. A listing of uniform item sources is provided on our "Resources" page under the heading "Uniforms and Accessories." Those who are currently a member in good-standing of the Marine Corps League may transfer their membership to our detachment through the completion and submission of a "Request for Transfer" form. Upon completion, the member should forward this form to their current detachment's commandant who will, in turn, endorse the request and forward it to the Outer Banks Detachment for action. Upon receipt of the favorably-endorsed request, the detachment staff will process it and join the requesting member in good standing to our rolls. Their is no fee associated with this request, however the transferee must pay any annual dues which are in arrears prior to approval.